Child-friendly?Alice in Wonderland offers a new, somewhat dark twist on the classic Lewis Carroll story. 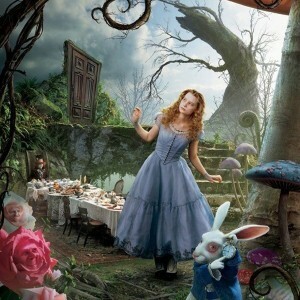 The movie follows a 19-year old Alice into the magical, whimsical world she first visited as a young girl. There, she sets out on a journey to find her true destiny and end the evil Red Queen’s rule of terror. This new adaptation may be enjoyed by many except purists of the original story. Although the movie is rated PG, parents should know that it may be too scary for younger children, especially in 3-D. It is recommended for kids aged 12 and older. Alice in Wonderland is the story of 19-year old Alice Kingsleigh, who remembers a recurring dream from her childhood about falling down a hole into another world. When she excuses herself following a public proposal from a high-class suitor, she follows a rabbit and falls down a hole into a world she calls the Underland. While there, she meets a white rabbit, a Mad Hatter, a chain-smoking caterpillar and twins Tweedle Dee and Tweedle Dum. She then learns that she’s been there before and is destined to defeat the bloodthirsty Red Queen and restore the peace-loving White Queen to power in a journey that helps her discover her true destiny. The movie was directed by Tim Burton, who is known for other fantasy films such as 2005’s Charlie and the Chocolate Factory and Edward Scissorhands. Stars include Johnny Depp as the Mad Hatter, Helena Bonham Carter as the Red Queen, Anne Hathaway as the White Queen and newcomer Mia Wasikowska as Alice. This version of Alice in Wonderland contains some violence that may be too scary for some kids. The Red Queen is obsessed with killing people and there are also some monsters and a battle scene. The film’s language isn’t vulgar, but may be deemed inappropriate by some parents. Expressions include things like "idiot," "stupid" and "lunatic." Parents should know, however, that true to the original, the caterpillar is shown smoking a hookah. The most positive message out of the film is that Alice learns to believe in the power of dreams and is strong enough to go against what is expected of her to achieve happiness. Parents can discuss these points as well as how the movie differs from the original version with their children.